I’d love to win! I read to my daughter every night from “Words To Dream On” ! 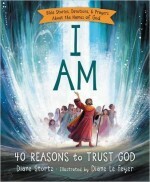 I’ve had “I Am – 40 reasons to trust God” on my wish list for a while now! Diane, I know a little girl who wouId love to win! I’m entering a her behalf. We would love to win! “Words to Dream On” is our family’s favorite nightly reading, and we are so looking forward to the Devotional! I’d love to win! We love the orgional “I Am” book. It’s beautiful! It would be wonderful to pair it up with your new devotional. Thank you for the chance. I’d love to win this for my kids age 8 and under! Thanks for the opportunity! I’d love to win to share with my grandkids 6, 8 and 8! They love your books! I’d love to win and share with my grandson! I would love to win one of your books for my grandchildren ages 3, 5, 7, and 10. I’d love to win this book. I would read it to my granddaughter and also use for children’s church and “In The Bag”. I’d also love to win! 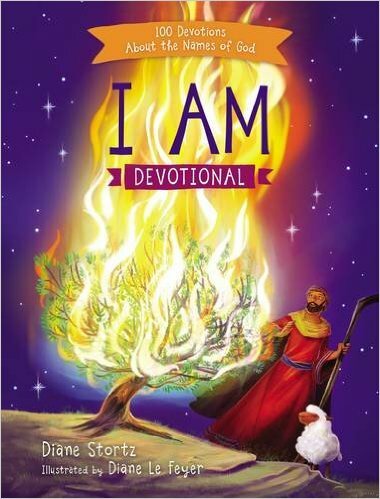 My granddaughters have the original book so the devotional would be a great addition! I’d love to win!! We have you bible story book and my girls so enjoy it! I’d love to win! I already have a copy of the main I AM book (if that disqualifies me, that’s OK). I’m sure the devo book is just as great! I’ll make good use of any prizes. I’d love to win! This devotional would be a blessing for young readers and families. I’d love to win! My two boys are book obsessed and eager to learn more about God. Your work would be so welcome in our house. I’d love to win this to share with my toddler class.